A Complete Farm Machinery and Livestock Security Welfare Solution. Monitor, Track & Recover Your Farm Assets. Protect Your Livelihood and Your Home. Crop and livestock disease, organised rural crime, opportunistic theft and inefficient equipment maintenance all greatly reduce farming profits. NFC Group’s Orion asset tracking and security solutions for arable and livestock farming allow you to monitor the health and safety of your bovine, poultry, ovine and porcine livestock and secure your assets in even the remotest parts of your farm. NFC Group’s Orion Data Network Farming solutions combine Radio Frequency Identification and internet of things technologies to create a real-time data feedback solution of tags and gateways. The system allows you to track, monitor and recover your farm assets, secure your farm buildings and keep your crops and livestock healthy. The weatherproof tags attach easily to interior and exterior walls, gates and electric fencing with special collars and ActiveHerdTM boluses for larger livestock. IoT sensors, attached to the tags, measure changes in environment and state such as location, temperature, tampering, tilt, shock and air quality amongst other conditions. The gateway is plugged into the farmhouse to give you your own private network of radial coverage of up to 10km, giving you actionable data insights into the location, safety and security of your farm assets, and the health of your livestock even in the most remote part of your farm. Orion feeds data back to you every 15 seconds when an asset is in motion or every 2 minutes when an asset is stationary, so you can get a complete 360 degree view of everything that is happening on your farm. If any of your farm equipment is stolen, our hand-held RFID readers use beacon mode to track the asset’s exact location, for fast recovery of your asset and increasing the chance of arrest and conviction. Out team of experts will liaise with the police for you to collate evidence and recover your assets fast. In the event of an emergency such as a temperature drop or unauthorised access through a gate, Orion sends you an instant alert to your mobile device s you can take immediate action to combat the issue. Orion provides up to 75% higher cost savings compared to other solutions in the market place. NFC Group has also partnered with Scrutton Bland insurance brokers to offer you a 10% discount on your annual insurance premiums and with Defra to provide funding for the Orion equipment you purchase. 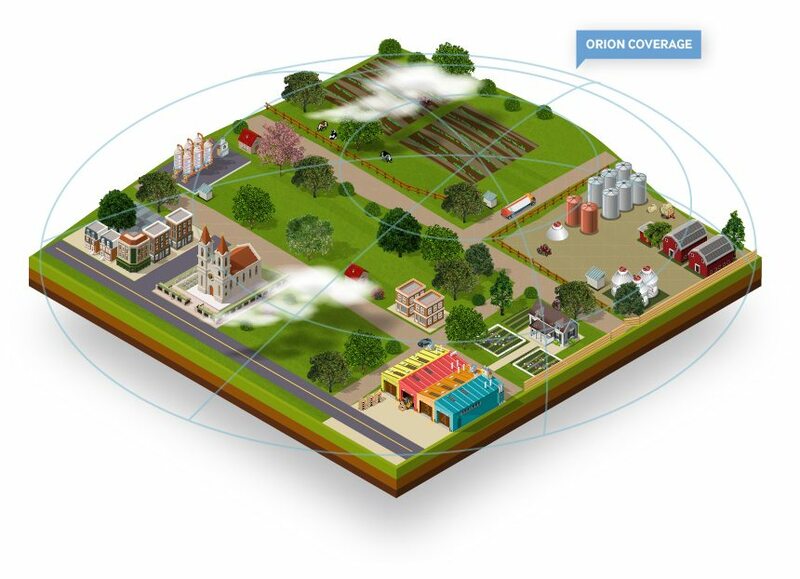 How Does Orion Benefit Your Farm? Crops and fuel in storage in your outbuildings are at risk from contamination and theft. We can create a totally customised Orion solution with sensors that measure the exact conditions you need to monitor to prevent issues like mould contamination, overheating, moisture and dehydration. Orion security solutions secure the entrance to your farm outbuidlings and integrate with your other security solutions such as CCTV to alert you immediately if thieves attempt to enter the storage and steal your crops or fuel. Rural crime in the UK costs farmers more than £39.2 million every year. Currently, only 9% of stolen farm equipment is ever recovered. NFC Group’s Orion solutions track and monitor the location and status of all your high value farming assets, so you can rest assured that they are secure at all times. In addition to providing security, because you can see your inventory instantly you can automate your farm processes to create predictive maintenance and repurchase schedules, increasing productivity and saving both time and money. Millions of poultry, cattle, pigs and sheep die each year from preventable diseases, fire, flooding, contaminated feed and unsuitable conditions during transit. NFC Group’s Orion Livestock solutions notify you instantly when individual animals show the first internal signs of illness; when a fire or flood occurs and if an intruder accesses your farm. From August 2016-July 2017 tuberculosis alone resulted in 41,107 cows being slaughtered in England, Scotland and Wales. You can protect your dairy, beef and brood cattle from the spread of many diseases with our ActiveHerd™ bolus solutions. To find out more about ActiveHerd™ click here. Temperature is critical to the health of chicks and brooding hens. Low temperatures cause death by pneumonia and overly high temperatures cause dehydration and pasting. With Orion you can constantly monitor the temperature of the environment where you keep your poultry to ensure that it is stable and optimal. If there is a rise or drop the system will alert you immediately so you can rectify the situation. You can also use Orion to track the whereabouts of your farmhands and other workers and visitors when they are alone on remote parts of the farm in order to ensure their safety. We also provide man down and SOS panic buttons to enable fast response in the event of an accident or emergency. Are your farm insurance premiums too high? NFC Group has partnered with Insurance Brokers, Scrutton Bland and Markel, to provide farmers with an ongoing 10% discount on your farm insurance premiums. NFC Group’s ActiveHerd™ boluses monitor and protect your cattle and our Orion asset security, tracking and recovery solutions to secure your farm assets, workers and land, greatly reducing the risks of livestock and crop disease and lost and stolen assets. So to get 10% off your insurance, all you have to do is talk to one of our experts and purchase the right solutions for your farm. For an average farm this 10% reduction provides annual savings of £3-5k, which more than covers the cost of your Orion solutions. So, you will have a cutting-edge security and livestock management solution at no additional cost to your rural business. Call NFC Group now on 01425485263 to secure 10% off your insurance. Could You Get Defra Funding for Your Rural Business? NFC Group have also formed a partnership with Defra to support farmers who want to ensure their farm buildings, equipment, livestock workers and other assets are safe, secure and healthy. When you buy and Orion Data network solution for your farm you may be eligible for reimbursement for some or all of your investment. To find out, call NFC Group on 01425485263 and ask one of our experts about Defra funding. Current Farm Asset & Livestock Location, Tracking and Real-time Alerts. Radio Geo Fencing with large area coverage for entire farm. Motion Sensors and Alerts for farm gates, fences, doors & site assets with optional links to CCTV. Water and Food Level Monitoring. Fire Alerts and Fire Suppression. Battery operated, easy to install clearly identifiable panic alarms to protect Farm staff and visitors. GPS tags with panic alarms for farm hands, other farm staff and visitors. Detailed information reports every 30 seconds in motion. No SIM cards or ongoing monthly contracts. Beacon mode enables assets to be found outside of Orion coverage anywhere in the world. Small physically active tag size – from AAA to D cell. Tags last from 12 months to 5 years per battery. Tags have multiple inputs for bespoke customisation if required. Adaptable technology – Orion can be integrated over an API to any server of your choice. 256 bit encrypted network for optimum cybersecurity. Simple plug and play hardware, no complex configuration required at farm site. Get full visibility and control over farm site access, farm hands and other staff, suppliers and other visitors. Orion beacon mode allows you to recover any lost or stolen farm assets. Orion is cost effective and easily scalable for when your farm grows or you require increased visibility or security. Work with your trusted rural neighbours to extend Orion safe zones around the local rural community. Enhanced farm asset visibility with a ‘daily audit’ of all important farm equipment & livestock. Track your livestock in real-time to ensure optimum health and security.